Manchester United are suffering from a "lack of freedom" under manager Louis van Gaal, says former coach at Old Trafford Rene Meulensteen. The Dutchman added that United no longer seem to have the "obligation to entertain" they had when he worked under Sir Alex Ferguson at the club. Wednesday's 0-0 Champions League draw against PSV Eindhoven means United have scored six goals in eight games. "The word is maybe rigid at times," Meulensteen told the BBC World Service. "You see players where the ball could have been played forward with a little bit of risk but they tend to go square or back. That's what the fans dislike at the moment. "When Sir Alex Ferguson was at the helm there was a clear style and identity but we also gave them the freedom to come up with their own solutions. There's a lack of freedom now." Last month, former United midfielder Paul Scholes said there was "a lack of creativity and risk" to the team's play under Van Gaal. Dutchman Van Gaal, 64, responded by questioning whether Scholes' criticism would benefit the Premier League club, adding that he did not agree with his opinion. 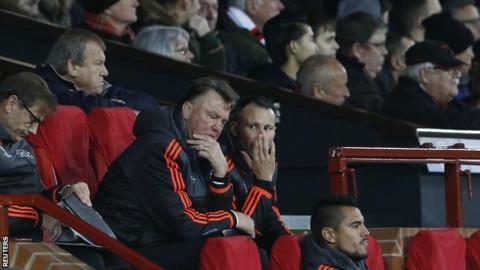 "Van Gaal has been hearing this message for quite a while now," added Meulensteen, 51. "He will say: 'We are second in the league, if we beat Wolfsburg we will be in the next round of the Champions League, so we are still making progress.'"